We have a blast with Gameloft's upcoming first-person shooter. Yesterday we visited Gameloft's offices in London, England to go hands-on with the upcoming fourth installment in the Modern Combat series, Zero Hour. We got a look at the first level of the single-player game Poison Arrow, and it's safe to say we came away more than a little impressed with the direction of the new title. 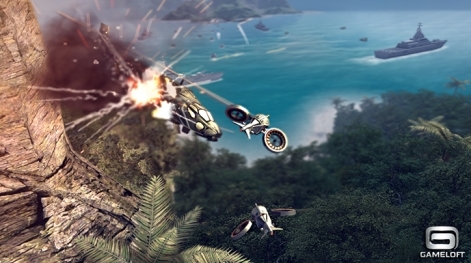 The mission begins with typical flair as a flying force of futuristic 'copters heads over rolling seas towards a compound on a tropical island. Naval ships glide along crystal blue waters, while rocket trails streak alongside your own aircraft. It's an impressive technical feat for the second-generation iPad we're playing the demo on, and the occasional dip in the framerate feels like an acceptable trade-off for the visual extravagance on offer. 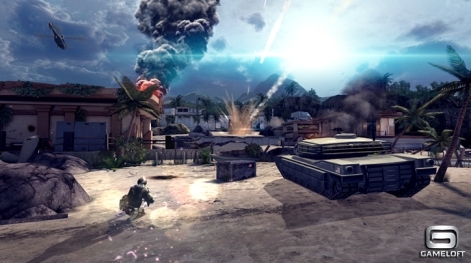 The fight in this introductory mission is against a team of rogue mercenaries trained by an elite military force. 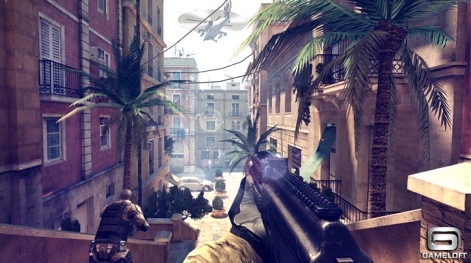 The early moments of the level are familiar ground for first-person shooter fans, with plenty of enemy clusters to snipe from cover as you move slowly through the interior and exterior sections of the island. As well as solid, traditional shooter action, there's no shortage of set-pieces in this early level either. Around a third of the way through the level it becomes necessary to clear out a heavily-defended pathway with a remote-controlled drone. Here the action switches to the perspective of the automatically steered robot, leaving you free to concentrate on ripping through the defenses using the machine's metal-shredding machine-gun. Later you'll call in an air-strike using a tablet device. The game also introduces a few console fads that we don't typically see in mobile gaming. Bursting through a door, your squadron leader finds himself flung to the side by a knife-wielding assailant who then sets upon you. Here you'll have to make a well-timed QTE swipe upwards on the screen to send the blade scattering away, before you deliver a damn good beating to the would-be assassin. With the compound's defenses in tatters, the only thing left for the squad to do is evacuate as quickly as possible. Here you'll find yourself manning the rear of an all-terrain jeep that blasts through gates and shoots over ramps, while you take careful pot-shots at the enemies hiding in cover. With an eye for the cinematic, time occasionally slows to a snail-pace so you can deliver a wicked blast of fire into the side of a helicopter, bringing it crashing to the ground before the action revs straight back up into fifth gear. We've yet to have a confirmed release date for Modern Combat 4: Zero Hour, but based on our brief hands-on it looks like the game's going to be worth the wait. There's still a handful of placeholder artwork scattered throughout this demo, and we hope that some of the framerate dips can be smoothed out between now and release, but Zero Hour is shaping up to give fans of the series exactly what they want: a game that's bigger, better, and even more bombastic.